An online Human Resources degree provides a path to a rewarding career in Human Resources (HR). Human resources professionals, a necessary component of successful businesses, work in practically every industry. A talented human resource professional optimizes the performance of a company through matching the best people with the best jobs, putting skills and abilities to good use. Some HR professionals work as HR generalists for small companies, whereas others work as HR specialists in a particular area of human resources for medium and large companies. Some large corporations have separate HR specialist positions for corporate and field jobs. What is a Bachelor in Human Resource Degree? A Human Resources degree online provides students with the undergraduate education necessary to pursue entry-level positions in the human resources field. Additionally, the degree acts as a stepping-stone toward future graduate study. Through curricula which cover fundamental aspects of human resources, students prepare to navigate the complexities of the field. Students study subjects such as business law and ethics, management principles, workforce planning and development, compensation and benefits, occupational training, conflict resolution, labor law, and more. Many Human Resources online degree programs include practical or field-experience coursework, such as an internship or capstone project, to give students real-world knowledge and help develop professional connections. How much does someone with a Human Resources degree make? Are there any certifications or professional organizations for Human Resources professionals? Penn State World Campus ranks #1 on The 20 Best Online Bachelor in Human Resources Degree Programs! Part of a tradition dating back to 1892, Penn State World Campus, the online affiliate of Pennsylvania State University, offers a wide variety of undergraduate, graduate, and professional programs, all online. With plenty of academic and professional resources, and military and veteran discounts available, Penn State World Campus meets the needs of non-traditional students from many diverse backgrounds. Penn State World Campus offers online Bachelor of Arts and online Bachelor of Science in Labor and Employment Relations degree programs that each prepares students to pursue careers in human resources. Both programs feature curricula that provide a strong foundation in important concepts in human resources, including business ethics and organizational psychology. The Human Resources Bachelor's degree online emphasizes management, communications, and quantitative aspects of the human resource field. Conversely, the Bachelor of Arts program places more emphasis in the social sciences and humanities. Colorado State University - Global Campus ranks #2 on The 20 Best Online Bachelor in Human Resources Degree Programs! Making up half of Colorado State University-Global Campus, the School of Management and Innovation offers a variety of online undergraduate and graduate programs. The School of Management and Innovation meets the educational needs of working and non-traditional students though flexible programs. The School of Management and Innovation offers an online Bachelor of Science in Human Resource Management degree program that utilizes courses aligned with SHRM standards for HR education. The program provides a wide variety of specialization options. Students learn to navigate the complex responsibilities of the human resources field, including conflict management, business law, and ethics. The program prepares students to pursue careers in human resources, or future graduate studies. Colorado State University-Global Campus is accredited by the Higher Learning Commission (HLC). University of the Incarnate Word ranks #3 on The 20 Best Online Bachelor in Human Resources Degree Programs! The School of Professional Studies at the University of the Incarnate Word caters specifically to the needs of adult, working, and non-traditional students. Through a variety of undergraduate, graduate, and professional programs, the School of Professional Studies provides non-traditional students with the educational advancement they need, with the flexibility of online and evening courses. Emphasizing career-readiness and real-world knowledge, the School of Professional Studies offers plenty of resources and support to help its students meet their personal and professional goals. The School of Professional Studies offers an online Bachelor of Arts in Human Resources degree program, featuring a curriculum aligned with SHRM guidelines for HR education. The program prepares students for the diverse responsibilities of human resources professionals, and the challenges of the field. Students engage in coursework which develops knowledge and skills in critical thinking, communication, technology, and more. Students develop a foundation in human resource management concepts, blending theoretical and practical learning. The University of the Incarnate Word is accredited by the Southern Association of Colleges and Schools Commission on Colleges. Saint Leo University Online ranks #4 on The 20 Best Online Bachelor in Human Resources Degree Programs! The largest Catholic business school in the US, the Donald R. Tapia School of Business at Saint Leo University Online provides business students with plenty of options for study, through undergraduate, graduate, and professional programs. Integrating the University's Catholic mission into its programs, the School of Business emphasizes leadership and business principles alongside religious and spiritual grounding. Through numerous partnerships with businesses on its industry advisory councils, the School of Business provides students with opportunities for professional connection and advancement. The School of Business offers an online Bachelor of Arts in Human Resource Management degree program that utilizes courses aligned with standards from the SHRM for HR education. The program emphasizes strong leadership skills alongside human resource management principles. Students establish a foundation in theoretical and practical knowledge and skills, including personnel law and organizational psychology. Students in the online Bachelor's degree in Human Resource Management must also complete an internship. Saint Leo University Online is accredited by the Southern Association of Colleges and Schools Commission on Colleges. University of Alabama at Birmingham ranks #5 on The 20 Best Online Bachelor in Human Resources Degree Programs! Housed in the Collat School of Business at the University of Alabama at Birmingham, the Department of Management, Information Systems, and Quantitative Methods offers a variety of undergraduate, graduate, and professional programs. The School of Business provides non-traditional students valuable support for advancing their careers. Through on-campus centers and outreach initiatives, the School gives students opportunities to network, engage in the field, and serve the community. The Bachelor of Science in Human Resource Management online degree program features a curriculum aligned with SHRM guidelines for HR education. With a strong emphasis on career-readiness and success, the program engages students through theoretical and practical learning. Students prepare to pursue careers in the field or future graduate study through developing a strong foundation in key human resource management concepts. Students in the online BS in Human Resource Management degree program must also complete an experiential requirement, which they can satisfy with an internship. The University of Alabama at Birmingham is accredited by the Southern Association of Colleges and Schools Commission on Colleges. The Collat School of Business is accredited by the Association to Advance Collegiate Schools of Business (AACSB). Indiana State University ranks #6 on The 20 Best Online Bachelor in Human Resources Degree Programs! The online wing of Indiana State University, Indiana State Online presents non-traditional students with a variety of options for study through undergraduate, graduate, and professional programs. With plenty of resources available, Indiana State Online meets the needs of non-traditional students in flexibility and support. Indiana State Online offers a Bachelor of Science in Human Resource Development online degree program, affiliated with SHRM. Students prepare for careers in human resources through a balanced curriculum which emphasizes theoretical and practical learning. Coursework for the program develops a foundation in key aspects of human resources, such as liability and occupational training. Students may choose elective courses to specialize in a particular area. Students in the online Human Resource Development Bachelor's degree program must also complete an internship. University of Maryland University College ranks #7 on The 20 Best Online Bachelor in Human Resources Degree Programs! The Undergraduate School at the University of Maryland University College offers students a wide variety of online undergraduate degree and non-degree options for study. Specializing in online and hybrid programs, the School provides non-traditional students with flexible, quality options to pursue higher education and professional advancement. Military and veteran students may receive valuable discounts and financial aid. The Undergraduate School's Bachelor of Science in Human Resource Management online degree program utilizes courses aligned with SHRM standards for HR education. Students engage in human resource management fundamentals, such as organizational culture, and employment law. Through developing a well-rounded foundation of knowledge and skills, students prepare to pursue careers in the field, or future graduate study. Florida Institute of Technology ranks #8 on The 20 Best Online Bachelor in Human Resources Degree Programs! A private university initially founded in 1958 as a way to educate the future professionals who would win the “space race,” Florida Institute of Technology has since expanded to offer programs in a wide variety of disciplines. Its online wing, Florida Tech Online, dedicated to the advancement of the non-traditional student, offers many of the same programs, but with the flexibility of online education. Florida Tech Online offers a Bachelor of Arts in Human Resources Management online degree featuring a curriculum aligned with guidelines from the SHRM for HR education. The program utilizes an interdisciplinary approach to explore the diverse aspects of human resource management. Students prepare for careers in the field through a balanced curriculum that builds a strong foundation in the leadership methods, the psychology of leadership, business ethics, and more. The Florida Institute of Technology is accredited by the Southern Association of Colleges and Schools Commission on Colleges (SACSCOC). Saint Mary-of-the-Woods College ranks #9 on The 20 Best Online Bachelor in Human Resources Degree Programs! Saint Mary-of-the-Woods College, founded in 1840, traces its origins to Saint Mother Theodore Guerin and the Sisters of Providence. Continuing the mission of its founders, Saint Mary-of-the-Woods College offers value-centered education programs rooted in the catholic tradition and designed toward personal and professional advancement. The Catholic women's liberal arts college provides numerous degree and non-degree programs. Saint Mary-of-the-Woods College offers an online Bachelor of Science in Human Resources Management degree program which utilizes courses aligned with SHRM standards for HR education. Students prepare for careers in human resource management through engaging in diverse issues from the field. The curriculum provides balanced development through focusing on fundamental aspects of human resource management, such as employment law, staff management, and benefits. Students may pursue internships to gain valuable professional experience and networking. Saint Mary-of-the-Woods College is accredited by the Higher Learning Commission (HLC). Concordia University St. Paul ranks #10 on The 20 Best Online Bachelor in Human Resources Degree Programs! Founded in 1893, Concordia University St. Paul provides a variety of degree and non-degree programs at all levels. A Christian liberal arts university, Concordia University St. Paul incorporates its foundational values into its many programs, promoting a diverse, Christian-centered community. Concordia University St. Paul offers a Bachelor of Arts in Human Resource Management online degree featuring a curriculum aligned with SHRM guidelines for HR education. The program emphasizes human resource fundamentals, such as ethical management, employment law, and staff management. Students prepare to pursue careers as leaders in human resources through balanced study. The courses in this online Human Resources Management degree program utilize an asynchronous delivery model. Concordia University St. Paul is accredited by the Higher Learning Commission (HLC). Ottawa University ranks #11 on The 20 Best Online Bachelor in Human Resources Degree Programs! Dedicated to developing well-rounded and well-qualified professionals, the Angell Snyder School of Business at Ottawa University offers a variety of undergraduate, graduate, and professional programs. Building on a liberal arts base, each program in the School of Business emphasizes the importance of technical and analytical skills and business acumen alongside ethical decision-making. Through the David C. Owen Leadership Institute, the School of Business seeks to empower students and the university community toward growth and positive change. The School of Business offers an online Bachelor of Arts in Human Resources degree program which utilizes courses aligned with SHRM standards for HR education. The program allows students to specialize their studies through concentrations in five different areas: Communication; Health Care Management; Leadership and Management; Entrepreneurship; and Global Operations. Students develop the skills and knowledge necessary to pursue an entry-level position in human resource management and future graduate study. Students in the online degree program must also complete a capstone project. Athens State University ranks #12 on The 20 Best Online Bachelor in Human Resources Degree Programs! Housed at Athens State University, the College of Business provides students with a variety of study options through undergraduate, graduate, and professional programs. Emphasizing the importance of critical thinking and professionalism, the College of Business seeks to produce well-qualified graduates across numerous fields. The College of Business offers an online Bachelor of Science in Human Resource Management degree program, featuring a curriculum aligned with guidelines from the SHRM for HR education. Students prepare to pursue careers in human resource management, as well as to future graduate study. The program provides balanced coursework which includes employment law, communication, and management principles. Students enhance their ability to handle the diverse responsibilities of human resource management. Students in the Bachelor in Human Resource Management online degree program must also complete a capstone project. Athens State University is accredited by the Southern Association of Colleges and Schools Commission on Colleges (SACSCOC). Metropolitan State University ranks #13 on The 20 Best Online Bachelor in Human Resources Degree Programs! The College of Management at Metropolitan State University offers a variety of undergraduate, graduate, and professional programs in the study of business and management. Emphasizing career-readiness and the importance of practical, real-world knowledge, the College of Management incorporates faculty with years of professional experience. The College of Management's online Bachelor of Science in Human Resource Management degree utilizes courses aligned with SHRM standards for HR education. Students study the diverse responsibilities required in human resource management, including staffing, ethics, and employee benefits. The online HR Management degree program prepares students to pursue entry-level careers in the field through developing a balanced foundation of knowledge and skills. Students in the online program must complete a capstone project. Metropolitan State University is accredited by the Higher Learning Commission (HLC). 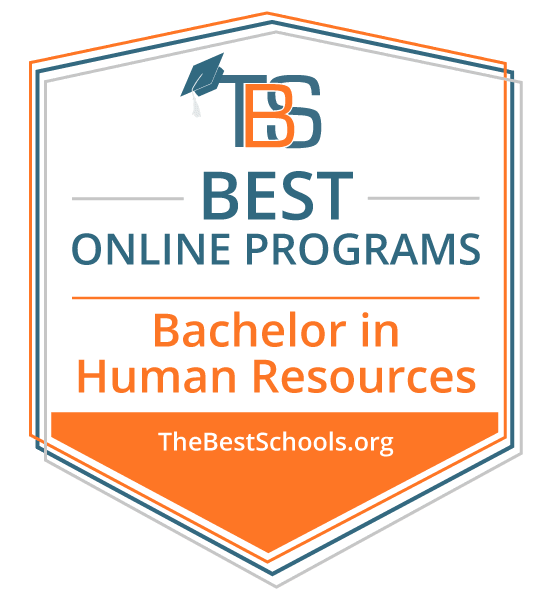 Dickinson State University ranks #14 on The 20 Best Online Bachelor in Human Resources Degree Programs! The Department of Business and Management at Dickinson State University offers students a number of undergraduate degree and non-degree programs. The programs promote sound business practices and ethical decision-making alongside the cultivation of professional skills and knowledge. The Department of Business and Management's Bachelor of Science in Human Resource Management online degree features a curriculum aligned with SHRM guidelines for HR education. Students study the fundamentals of human resource management, balancing theoretical and practical knowledge. Students in the program enhance their ability to address the diverse responsibilities of human resource management and pursue entry-level careers in the field. Wilmington University ranks #15 on The 20 Best Online Bachelor in Human Resources Degree Programs! With a commitment to career-readiness, the College of Business at Wilmington University utilizes a practitioner-based faculty to lead its programs. The College of Business provides students with plenty of options for study through undergraduate, graduate, and professional programs. Emphasizing sound business practices and an understanding of community needs, the College prepares students for a variety of careers in diverse fields. The College of Business offers an online Bachelor of Science in Human Resource Management degree program that utilizes courses aligned with SHRM standards for HR education. The program focuses on developing the skills and knowledge necessary for students to enter the human resources field. The program emphasizes understanding and application of human resource management fundamentals. Students may pursue internship and co-op experience opportunities to gain valuable experience and develop professional connections. Limestone College ranks #16 on The 20 Best Online Bachelor in Human Resources Degree Programs! The Department of Business and Economics at Limestone College offers a variety of undergraduate programs and an MBA. The department's many online programs allow it to extend this mission to non-traditional students of diverse backgrounds. The Department of Business and Economics offers a Bachelor in Human Resource Management online degree which prepares students for a variety of careers in the human resource management field. Students engage in a curriculum built on human resource fundamentals, including ethical decision-making, communications, and labor relations. Limestone College is accredited by the Southern Association of Colleges and Schools Commission on Colleges. Regis University ranks #17 on The 20 Best Online Bachelor in Human Resources Degree Programs! Committed to advancing the Jesuit tradition through education, the College of Business and Economics at Regis University emphasizes experiential learning. Offering a variety of undergraduate, graduate, and professional programs, the College of Business provides students with plenty of options to study and advance. Students have access to valuable resources through several research and professional development centers on campus, including the WELL Center. The College of Business and Economics offers an online Bachelor of Science in Human Resource Management degree program, featuring a curriculum aligned with guidelines from the SHRM for HR education. Students prepare to pursue careers as successful human resources managers through studying the fundamentals of the field. Blending practical and theoretical knowledge, students develop the skills and foundation necessary to navigate the complex responsibilities of human resources management. Southwestern College Professional Studies ranks #18 on The 20 Best Online Bachelor in Human Resources Degree Programs! Southwestern College Professional Studies provides viable study options for professional and non-traditional students to receive education on flexible terms. The College provides a variety of evening and online programs. Southwestern College Professional Studies provides a Bachelor of Science in Human Resource Development online degree program which prepares students to enter competitive professional environments. Students engage in human resources fundamentals, including legal and ethical issues, compensation, and performance management. Students must also complete a capstone project. DeSales University – Division of Business ranks #19 on The 20 Best Online Bachelor in Human Resources Degree Programs! Through undergraduate and graduate programs, the Division of Business at DeSales University provides students with the foundation they need to succeed in careers in business. The Division of Business encourages students to develop real-world experience alongside theoretical knowledge by offering numerous internship opportunities. The Division's programs promote growth through developing a strong foundation in sound business practices and principles. The ACCESS Program at DeSales University - an accelerated Bachelor's degree program for adult learners - offers an online Bachelor of Arts in Human Resource Management degree that combines a liberal arts foundation with practical training. Students learn to apply human resource management principles to solve common business problems. The program prepares students for careers as competent and informed human resource managers. Students in the online Bachelor of Arts in Human Resource Management degree program must also complete a capstone project. DeSales University is accredited by the Middle States Commission on Higher Education (MSCHE). Franklin University ranks #20 on The 20 Best Online Bachelor in Human Resources Degree Programs! Franklin University, established in 1902, has campuses in Ohio and Indiana. The University focuses on working adult learners. The University provides a wide array of degree programs. Franklin University's online Bachelor of Science in Human Resources Management degree program covers subjects such as performance management, legal compliance, employee and labor relations, workforce planning, organizational development, talent management,. The program aligns with SHRM's HR Curriculum Guidebook. The program includes 124 semester hours. Franklin University also provides an online Human Resources Management – Subsequent Bachelor of Science degree, designed for students who already completed a bachelor's degree or higher. Franklin University is accredited by the Higher Learning Commission. Individuals with a Bachelor in Human Resources degree may pursue a variety of positions in the field. With an online Human Resources degree, individuals may pursue several notable professional certifications. Certification identifies its holder as an expert in the field, and serves as a very attractive qualification to an employer. Society for Human Resource Management – The SHRM offers valuable certification for HR professionals. Through either the SHRM-CP or the SHRM-SCP exam (depending on education, professional experience, and responsibilities) individuals may achieve SHRM certification. Many of the best degree programs align their curricula to SHRM standards. HR Certification Institute – The HRCI seven certification options meet various professional needs. These certifications include the PHR, a general certification for professionals, and the aPHR for entry-level professionals. Each certification signals the competence and professionalism of the holder. Society for Human Resource Management (SHRM) ¬– The world's largest HR professional organization, SHRM boasts over 285,000 members worldwide, with seven decades of experience and reputation under its belt. Membership includes networking with its member community, professional conferences, career development programs, access to its publications, and plenty of useful resources. National Human Resources Association (NHRA) – A professional membership organization, the NHRA provides individuals with numerous member benefits, such as career development and job search assistance, newsletters, conferences and networking, and connection with NHRA affiliates. Academy of Human Resource Development (AHRD) – Founded in 1993, the AHRD remains committed to the advancing the human resources field through dialogue and connection. Membership includes benefits such as conferences, networking, access to publications and other useful resources, and more. International Public Management Association for Human Resources (IPMA-HR) – The IPMA-HR provides its members with connection in the human resources field on the international scale. Membership includes access to publications and research, career advancement help, conferences, and a worldwide member network. IPMA-HR also offers certification. HR Certification Institute – Besides its notable professional certifications, the HRCI offers numerous useful resources to advance the field, and holds professional conferences.